Promotion Optimizer is an application for Promotion Analysis and Optimization workflow. One of its 3 functionalities is the Promotion Planner. This functionality is the first step in executing a promotion and capturing the data which is later needed for analyzing the performance of the promotion. 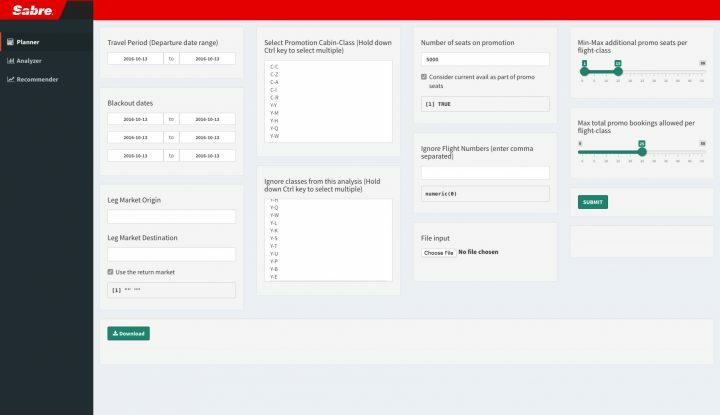 It is a decision support application that helps in selecting flight-departure dates and allocating the right amount of promotion seats to them. For every flight-departure date the application determines expected dilution in revenue that can happen by opening up promotion classes. This way airlines can avoid revenue dilution in popular flights and run promotions only on the flights that would otherwise go with too many empty seats. Hence it helps in stimulating demand on the right flights. The analysts can use this tool to optimally allocate thousands of seats across thousands of flight departures very quickly. Additionally they can run multiple scenarios to make better-informed decisions.